One of the keys to being productive is naturally knowing how you spend your time. 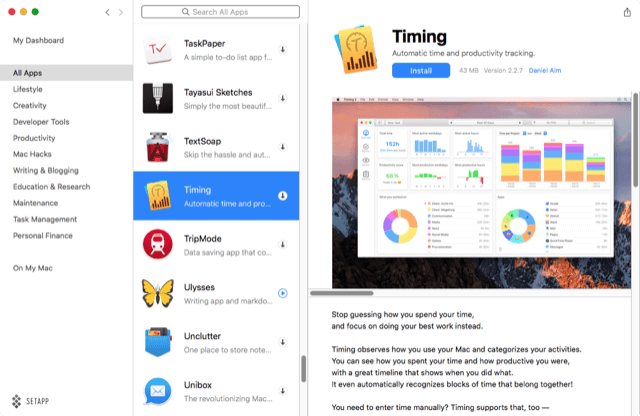 If much of your work and time is done on your Mac, Timing 2 is one of the best ways to keep track of the time you’re working in specific applications, websites, documents, and even tasks you do beyond your computer. Best of it all, Timing is truly automatic. It works in the background while you work. I only occasionally do work for billable hours, but I still like using Timing because it helps me monitor how much time I’m spending checking email, writing blog posts, doing research, working on freelance jobs, and browsing the Internet. At the end of my workday or the next day, when I see my productivity score of above 75%, I can clearly see how and where I spent my time. I use the Timing reports to help schedule tasks in my task manager, Todoist. 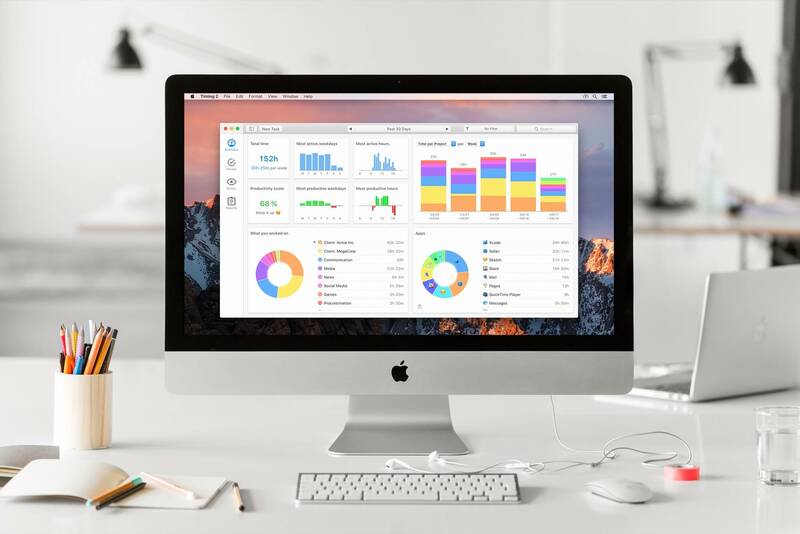 Basically Timing keeps track of the time you spend in nearly ever application, website, folder, and document you launch and bring to the forefront on your Mac. So for example, I try not to spend more than 30 minutes a day in Mail—about 15 minutes each in the morning and afternoon. Timing does an excellent job letting me know if I’m going beyond my desired time. For each project or task you set up in Timing, you need to assign a rating for the task project as how productive or unproductive you think that task is. For example, though most my emails are related to the work I do, I don’t think spending time in Mail is the most productive use of my time. So I don’t rate it as being fully productive. Thus the more time I spend in Mail the more time it takes away from my overall productivity score. Timing can track tasks based automatic simple rules you set. As you can see in the rule below, Timing tracks when I’m working Apple’s Mail, but I can also add to the working in Google Mail or other related applications or documents as a part of my email tasks. If I’m working in Mail and I do other related tasks, such as doing research for an email I’m working on, Timing will track the pages I researched, and I can later add those tracked pages to my Mail project to get a more accurate reporting of the time spent with the task. However, when it comes to blog related tasks, I assign those tasks a 100% productivity rating. The rules for tracking blog related tasks include the rules for my two websites, which are automatically tracked by Timing. At the end of the day or the next morning, I review the list of unassigned tasks in Timing and drag them to the appropriate projects in order to account for that time. The best way to assign rules is to set up projects for the areas of work you do everyday. You may not want to get as detailed as I do, but I think it helps to see how much time I’m spending in various type of tasks and projects. 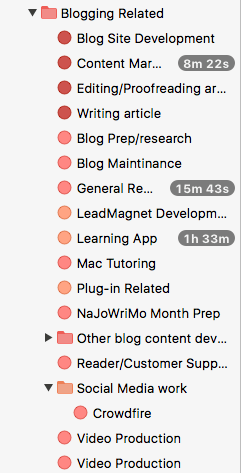 For the tasks I rate as most productive, they get color coded red or a variation of. My least productive tasks get assigned yellow or a color close to it. You can manually set up rules in Timing, similar to how you set rules for Smart Mailboxes in Mail or iTunes. 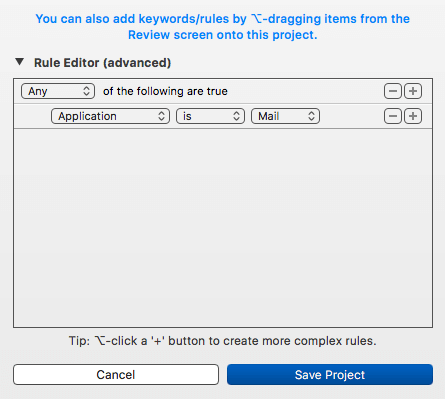 But the best way to create a rule is to click on a tracking item, hold down the Option key, and drag that item to the project for automatically creating a rule. Timing will identify the item you drop into the project as either an application, file, or website URL. Any tasks that are not a part of an existing rule will show up in the Unassigned category. Unassigned items can be dragged to the appropriate project for that day, or Option-dragged to create a permanent rule. 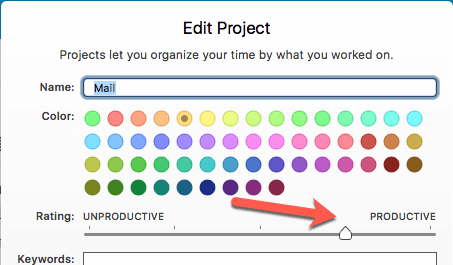 Tip: Option-drag a task to a project, and it will automatically be configured as a rule in that project. The more rules you set up, the less items that will appear in the Unassigned category, especially if you tend to work in the same applications, websites, and documents several times a week. Timing also keeps track of key words in the documents you’re working in, but I don’t have much use for the keyword feature. 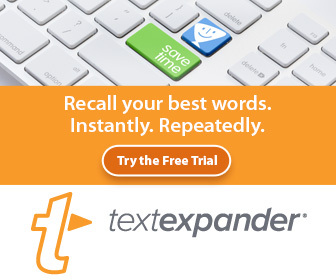 Timing’s robust reporting feature should provide you a motivational boost. It’s great to see your score at the end of the day. 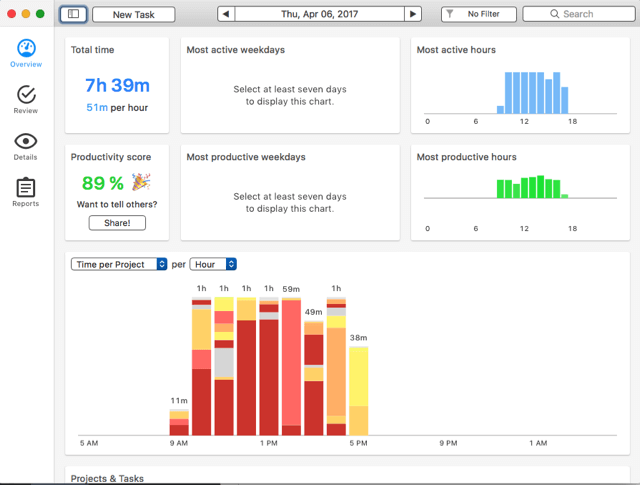 If it’s lower than it should be, you can review which tasks contributed to your lower productivity. My most productive days is when I can get in six to seven hours of work with lots of red in the bar graphs. That doesn’t happen everyday, but I strive for it. 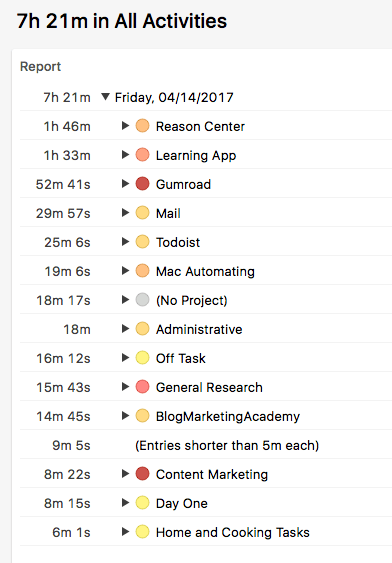 My yellow coded tasks include checking Mail, browsing iTunes music, non work related Internet browsing, and even spending time in Timing. As much as I like Timing, I want to make sure I’m spending less than a few minutes per day in the application. Note: it will take a few weeks of assigning ratings for tasks and projects, and setting up rules to get a more accurate assessment of your productivity. Simply be honest with yourself about how productive your tasks are, and when you’re off task, be sure to report that. The Timing report features can display your productivity also by times per application used, hours throughout the day, by day, week, month, and year, and by projects. Reports can be exported to CSV, PDF, HTML, and Excel formats. Timing is most beneficial for those who need to keep track of billable hours, but I like to use it to motivate my daily work, along with using my task manager of choice, Todoist to assign tasks. For example, I want to know how much time I’m spending doing research or learning application for purposes fo writing an article. Why is that important you may be asking? Well, that information is helpful for when I’m scheduling tasks in Todoist. By using Timing, it reports that I generally spend about 2 hours writing the first draft of an article. It also lets me know about how much time it takes me to do related research for article writing. In Todoist, my priority settings are based on general times. Priority 1 tasks are 2+ hours. Priority 2 tasks about an hour or less. Priority 3 tasks are 15 minutes or less. And priority 4 tasks are pretty much simple reminders, such as when a bill is automatically being paid through my bank. 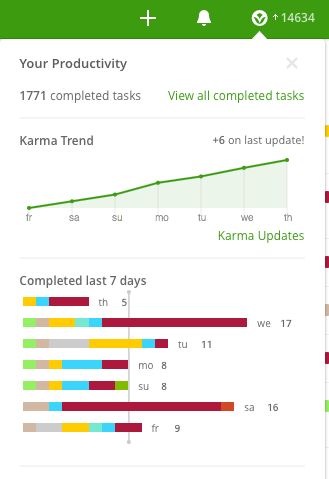 Todoist also includes a reporting feature that I use to motivate me to complete a minimum of 8 tasks per day. As with my other applications, I use BetterTouchTool to trigger menu items in Timing. Since most of what I do in Timing is browse the data, my assigned finger gestures quickly allow me to switch between the Overview, Preview and Reports views. I also have a finger gesture that quickly takes me back and forth between the Today and Yesterday reports. Timing is not cheap, and that’s mainly because the developer has spent lots of time improving and revising the application. If you’re interested in Timing, please use the affiliate link below. I only use affiliate links for programs that I actually use and/or that I have tested and found useful for other users. There’s much more to Timing than I share in this article. The developer has created a free 5-day email course that introduces how to use all the features of Timing. 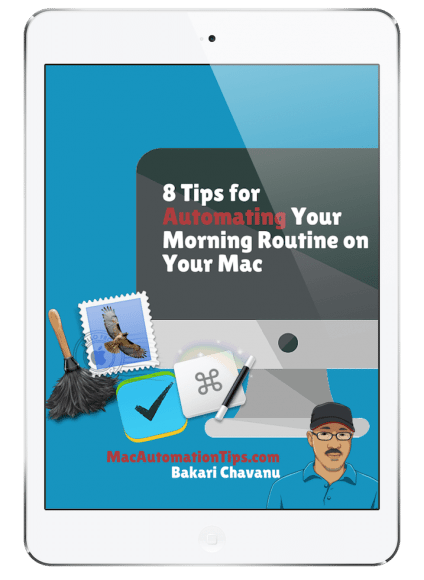 As you get all your automatic rules and ratings set up for your routine tasks and projects, you’ll spend less time in Timing and more time working to stay productive. 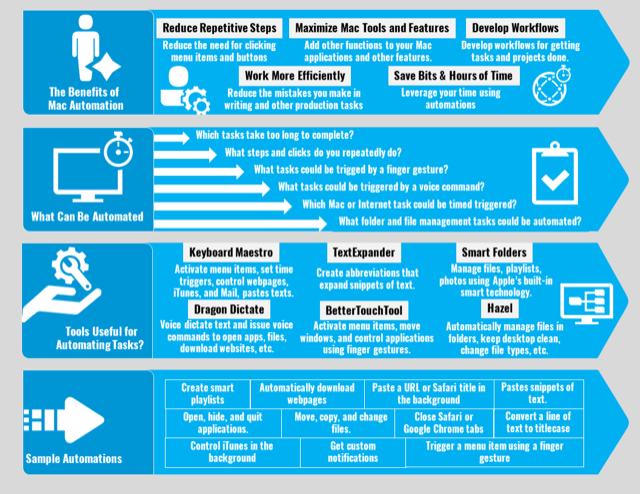 Let me and others know what you think of Timing and how you plan to use in your daily workflow. You can try out Setapp for free 7-day trial, which means you can not only try out Timing for a month, but there over a hundred other apps you can download and try out as well. You don’t have to provide a credit card to register for Setapp. At the end of your month trial, you can sign up for a $9.99 subscription, which gives you access to Timing and all the applications in the suite. 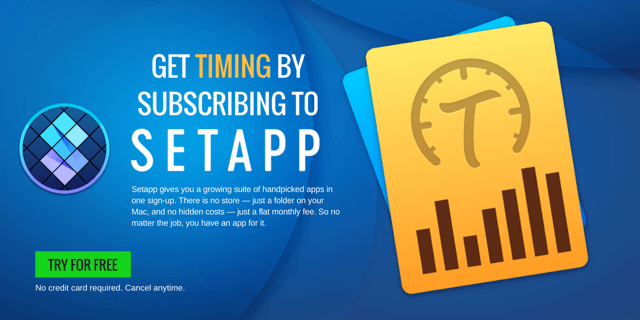 More applications get added to Setapp on a regular basis. 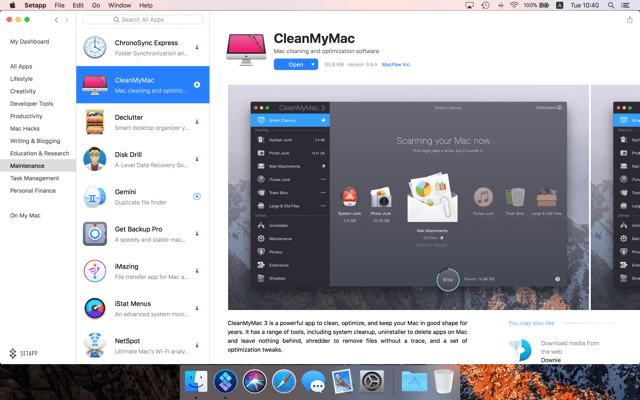 Here’s my longer review of Setapp. Let me know what you think of Setapp and Timing.